Howard Hersh (1940- ) studied music and earned Bachelor’s and Master’s degrees at Stanford University. 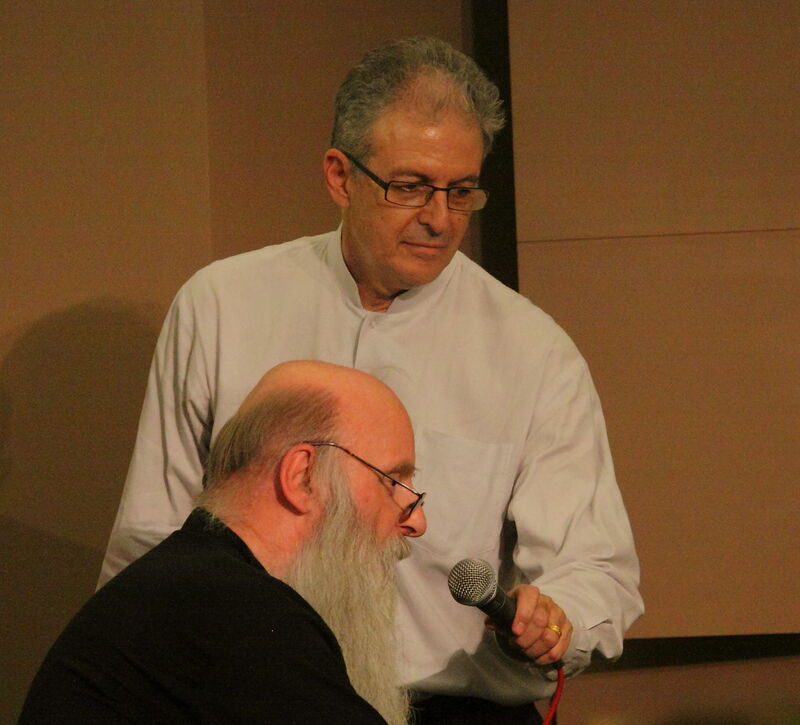 He is a California native and he succeeded Charles Amirkhanian as music director at KPFA. His Pony Concerto (2005), Braided River Nights (2004) and Sonata for Violin and Percussion with String Bass obligato (2000) were released on Albany Records in 2007 and his Dancing at the Pink House (2006) is available as a free download on Bandcamp. I had not been familiar with Mr. Hersh’s music when I agreed to review this disc but I found that liked it immediately and it made my list of favorite releases for 2014. The featured piece here is the Concerto for Piano and Ten Instruments (2008) and it is a tour de force. Hersh writes in a tonal idiom that sounds to this reviewer’s ears like a mix of Conlon Nancarrow and Francis Poulenc. This concerto is virtuosic in the extreme but not the empty virtuosity of the romantic composer pianists (Anton Rubinstein bores me to tears). This work in three movements sounds very difficult to play but manages to remain playful and entertaining, never taking itself too seriously. Pianist Brenda Tom does a fantastic job (she must have fingers of steel) and is very ably supported by the small ensemble conducted by Barbara Day Turner. Rapid attacks, scales and arpeggios keep the soloist very busy and the ensemble clearly listens and collaborates in what is an electrifying performance. The other pieces on the disc are a sort of strange contrast to the concerto. 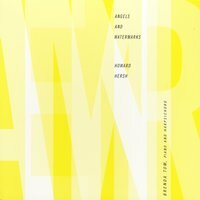 First is a suite for harpsichord, Angels and Watermarks (2004) was composed during Hersh’s residency at the Djerassi Arts Center. The piece is in five movements and is a significant contribution to the contemporary literature for that instrument. Cast in the manner of a baroque suite, each movement plays on familiar forms. The first movement is a ponderous prelude which is followed by a playful moto perpetuo, a gentle lullaby, then a spectacular jazz inflected toccata and finally a sort of non-literal recapitulation of the prelude. Again we are treated to the dynamic keyboard work of Brenda Tom who executes each movement flawlessly and with great expressiveness. The final work on the disc is Dream (2012) which the composer (who wrote the liner notes) says is his exploration of how to incorporate tonal harmony in his work. It is a soft, slow meandering piece in which he manages to make his explorations into a beautiful and restful work. Brenda Tom is the dedicatee of both this and the harpsichord suite and she demonstrates her ability to work with soft expressive textures. All in all a great CD which will delight any new music fan. It is available from CD Baby and Amazon. Highly recommended. 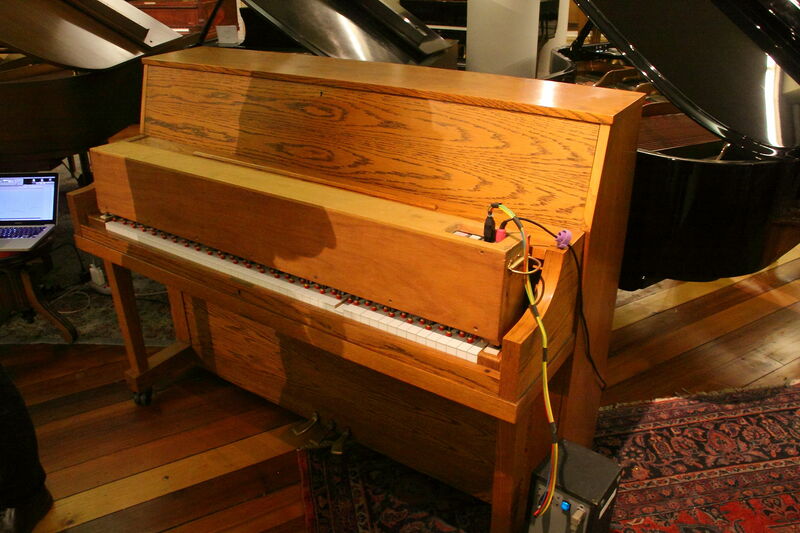 October 27th, 2012 would have been the 100th birthday of composer Conlon Nancarrow. While still not a household name his work has become better known through recordings and live performances over the last 30 years or so. He spent the majority of his creative life working in relative obscurity in Mexico City. While known by some of his contemporaries his music first became widely known through a 1969 Columbia Records release, part of that label’s ‘Music of Our Time’ series curated by David Behrman. 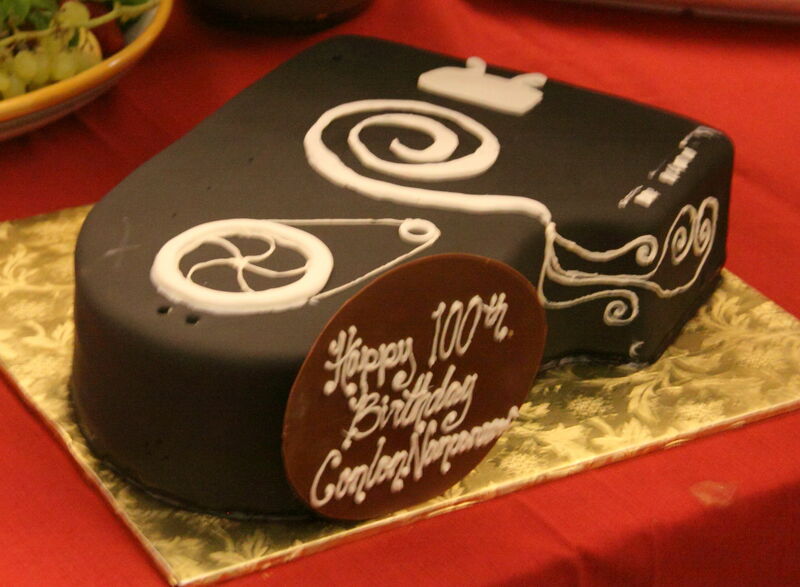 The evening’s celebration of his 100th birthday I’m sure would have made him proud. 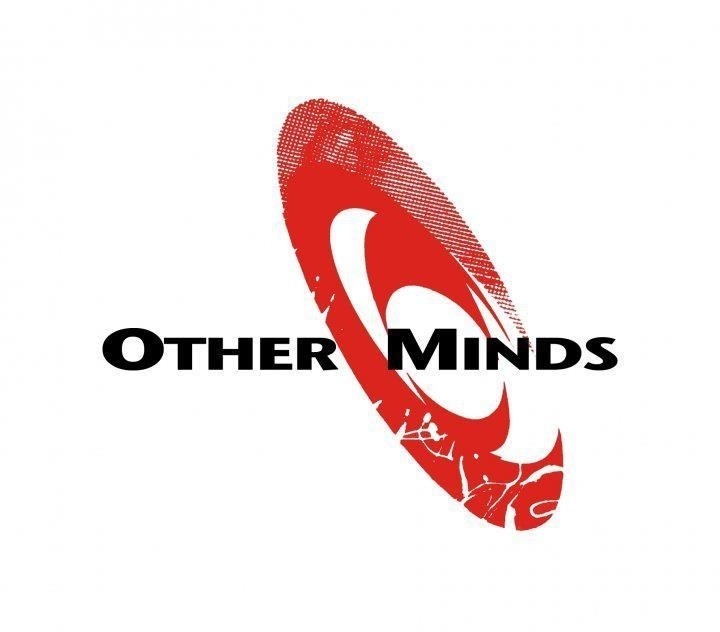 Curated by bay area new music advocates Other Minds and hosted by the Piedmont Piano Company in downtown Oakland was a sort of preview of the next weekend’s three day event. In the beautiful space of that showroom the audience was treated to hors d’ouerves, wine before the concert. The event opened with a portion of a film by Jim Greeson, a documentary about the life and music of Nancarrow that painted him as another (if the most radical) of the musicians who were born in Texarkana, Arkansas which claims Scott Joplin as one of it’s famous sons. This was followed by pianola virtuoso Rex Lawson who played a few of Nancarrow’s early studies. 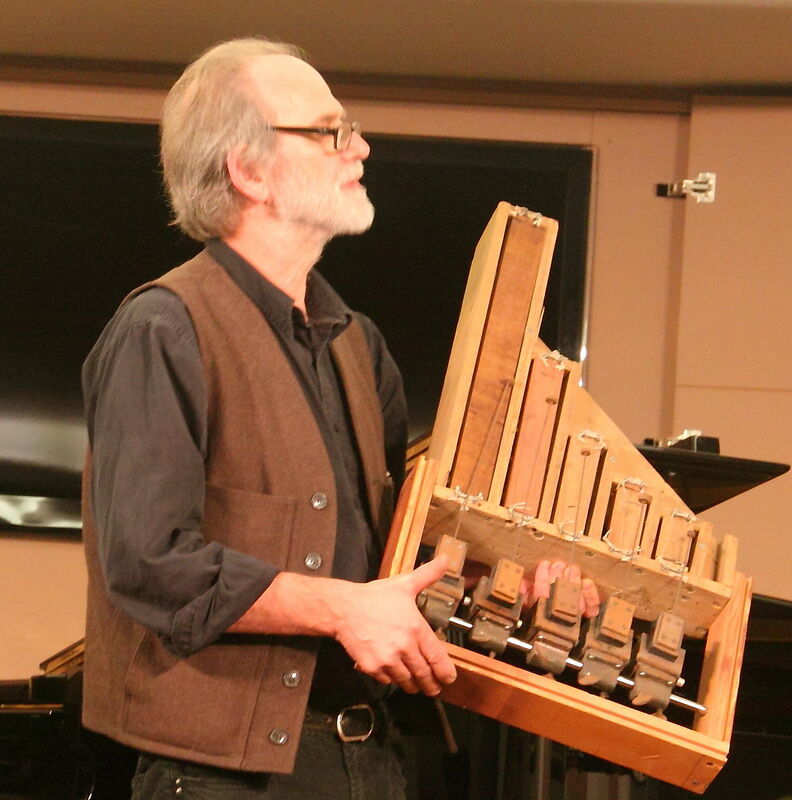 The pianola is not the same thing as a player piano, as Lawson informed the audience. It is a device which fits over the keyboard of a traditional piano and depresses the keys based on the instructions of a paper roll inserted as one would in a player piano. However the pianola allows the performer to vary dynamics and phrasing and actually perform the music. And Lawson demonstrated this beautifully. Pianola showing the place where the paper roll is inserted. At the intermission birthday candles were lit and Lawson was accorded the honor of blowing them out in the late composer’s honor. Nancarrow died in 1997 having lived to see a tremendous resurgence in interest in his music and an acknowledgement of his contribution to music. His complex rhythm studies for player piano number just over 50. And though he wrote some chamber and orchestral music as well, these are the pieces on which rest his fame as an innovator. 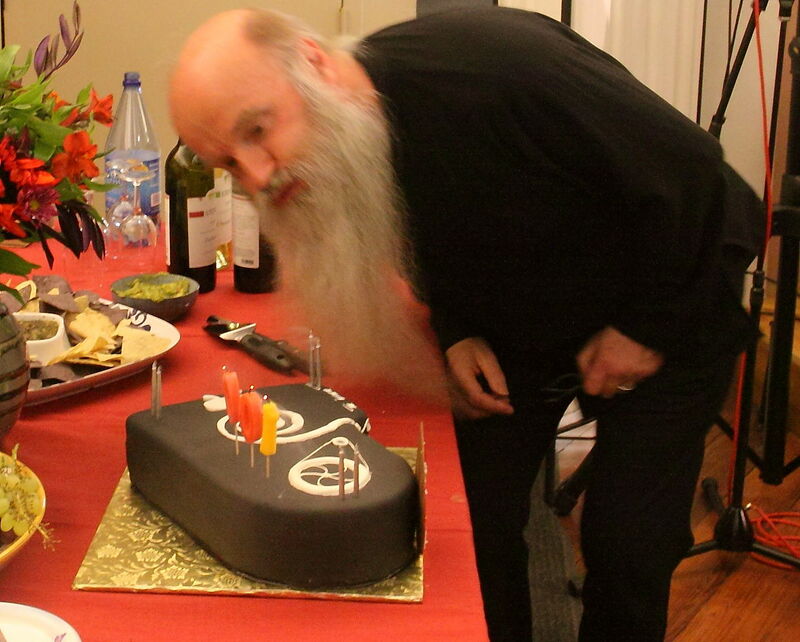 Rex Lawson blowing out the candles on Nancarrow’s birthday cake. Just prior to the intermission we were treated to the multi-talented artist an composer Trimpin‘s computer controlled pianola. 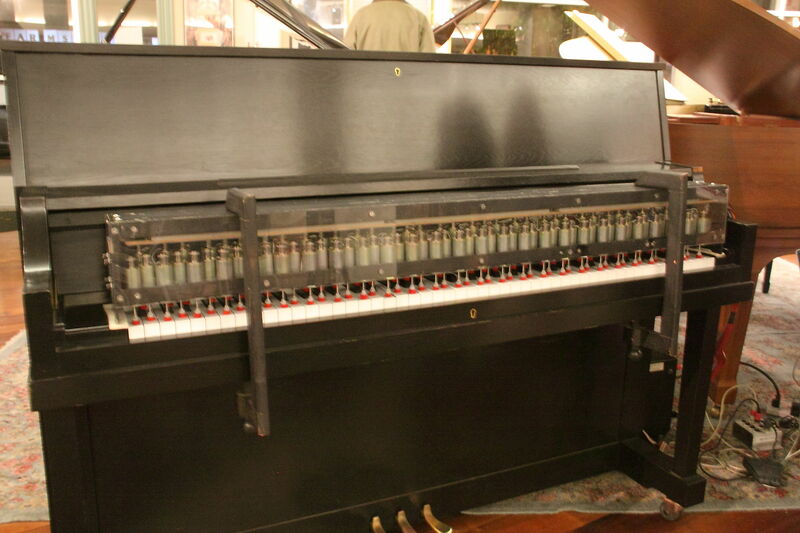 Attached to two pianos were devices for pressing the keys which were in turn controlled by a computer program. They played the massively complex Study No. 40b and did so very effectively. The audience left their seats to stand around the two upright pianos which behind the seating area. 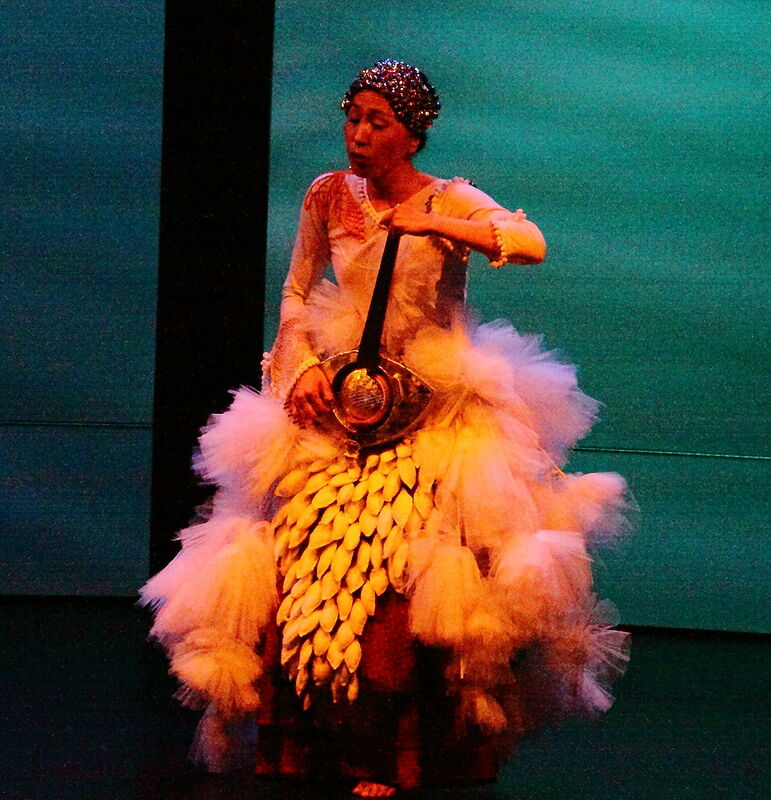 The sound cannot be described in words and the audience, some perhaps mystified, were very appreciative. Trimpin later spoke of this work reconstructing one of Nancarrow’s abandoned project, a percussion orchestra controlled by a piano roll. It was abandoned when Nancarrow realized that the technology could not perform the music accurately, something which is now possible with Trimpin’s research. The results of that research, Trimpin: Nancarrow Percussion Orchestra / MATRIX 244 will be installed in the Pacific Film Archive and be available to the public from November 2nd to December 23rd. After the candles were out the audience, led by Charles Amirkhanian, sang happy birthday which prompted Lawson to spontaneously run to one of the pianos to accompany the traditional song. Charles Amirkhanian, composer, radio host and impresario produced the first complete recording of Nancarrow’s player piano studies (and the only recording made on Nancarrow’s player pianos in his Mexico City studio) in 1980 which brought the composer to a much wider audience and got him invited to the 1982 New Music America festival and later helped him get a Mac Arthur genius grant. A chance find in a record store in Paris inspired Hungarian composer Gyorgy Ligeti to write his masterful piano etudes after hearing these recordings. Trimpin scanned all of Nancarrow’s piano rolls into a computer and made it possible for the music to be studied more widely as well as preserving it on a hard drive. He went from the piano rolls which are essentially a digital medium the equivalent of punch cards for historians and those of us old enough to remember to digital storage on a magnetic drive. As I noted at the beginning this was a most appropriate tribute occurring on Nancarrow’s actual birthday and featuring people like Amirkhanian, Lawson and Trimpin who were inspired by Nancarrow’s work and have done so much to bring it to light and to preserve it for posterity. Following the intermission we were again treated to Rex Lawson who provided a perspective on the importance of player pianos and pianolas in early 20th Century culture. He illustrated the function of the pianolist explaining as he said, “Why I need to be here at all…” by playing a Rachmaninoff polka first without any nuance executed by the pianolist and then with him demonstrating how the pianolist puts life into the piece, a world of difference. He spoke of composers who actually wrote for the pianola. It is different from writing for a pianist because the pianola is not limited to the size of one’s hand or the number of fingers one has. It afforded composers a technology to write a more orchestral fabric. He demonstrated with pieces by Sir Arnold Bax, an early 20th century British composer and by Stravisnksy (a marvelous arrangement of the scene from Petroushka when the puppet first comes to life). 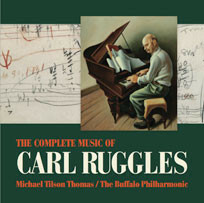 He also spoke of now forgotten composers who had the career of being arrangers for the pianola. 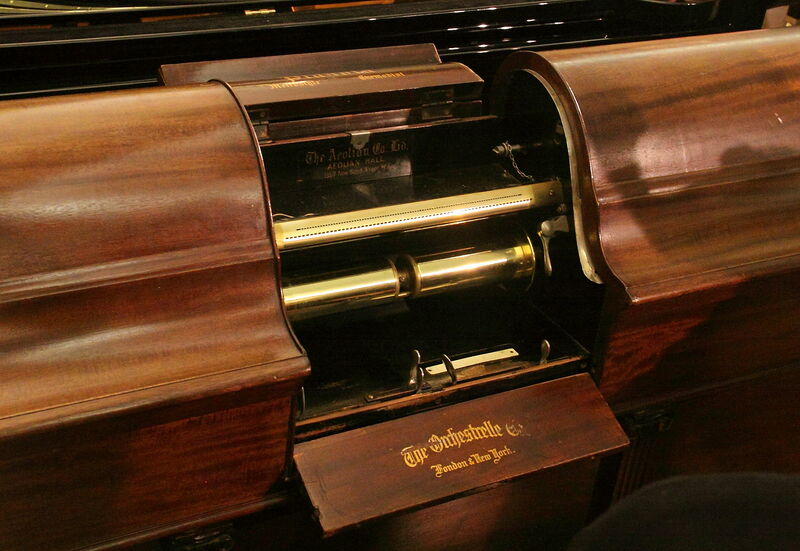 While many homes had pianos and many could play the piano, the pianola allowed them to play larger and more difficult works beyond the skills of the average pianist and, frequently, beyond the skills of any human being. The evening ended with another demonstration of Trimpin’s computer driven pianola this time playing one of Nancarrow’s early boogie woogie pieces. And then there was time to speak with the artists and audience members who showed enthusiasm and interest. Tonight’s event, we were told, was organized by Other Mind’s development director Cynthia Mei and she made a plea for funding this and next weekend’s events through Kickstarter (http://www.kickstarter.com/projects/otherminds/nancarrow-at-100-a-centennial-celebration?ref=card) where the rewards for participating in the funding range from mention in the program booklet to CDs, t-shirts and downloadable recordings of the performances. This writer is a proud part of the kickstarter campaign and would like to encourage others as well. We are honoring a true genius in American music and preserving his influence and legacy for future generations. I think Mr. Nancarrow would have heartily approved.